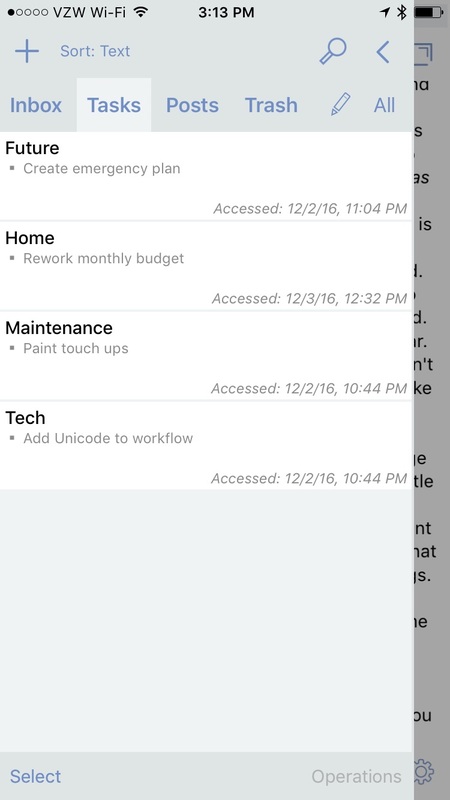 Using Drafts, Reminders, and Slackbot as a task management system. I know, this sounds like a fever dream. Stay with me. I promise it’s headed somewhere. Over the summer, I made the decision to split my work and personal tasks between two separate systems for a lot of reasons. It’s stuck, and I’m really happy with that decision. I also decided that in terms of thinking about personal tasks, a basic hierarchy is all I need. There are things that need to get done by a certain time, and then there’s everything else. I was using OmniFocus for this to great success. But if I’m honest with myself, I’m still over engineering things. Work stuff, ok, there’s other people and dependencies, and lots of other things at play. But my life? At home? I essentially need lists, and that’s about it. Simple, basic lists. With the occasional nudge to do something once in a while. I’ve also been (re)drawn to the idea of using as much of the stock OS as possible, which means I’m looking at Reminders for things. I’ve been down this road before. Reminders is great because of what it does, which is exist on all your devices without a bunch of extra effort and mostly capture things in a reasonably expedient manner. But what it doesn’t do is allow you to make changes to those items easily and quickly. Or sometimes sync reliably (I had weird duplication of tasks, and stuff marked as done come back from the dead multiple times). All it takes is a few cracks in the facade, and I’m running. So while in principle, having all those unchanging things (bills, medication alerts, household stuff) always available on any new device via iCloud, it just didn’t feel like enough to take the throne. iOS 10 seems to have fixed a lot of the weird behavior I noticed previously. Also, if I’m not forcing Reminders to be a system it’s not–i.e., using it for what it’s actually good at–I can actually derive an incredible amount of value from it. Here’s what it does well: it reminds you to do stuff. If an alert fires, and you don’t dismiss it or complete it, it hangs out on your lock screen until you do. Every time you look at your device, it’s there, like “hey, yeah, hi, don’t forget this thing”. Simple, quiet, persistent. I like this behavior. Well. I had a good think about this, and realized that if I’m using this tool correctly, chances are I’m not making changes, but I do still need a little flexibility in assigning those dates and times. So as always, I turned to Workflow. 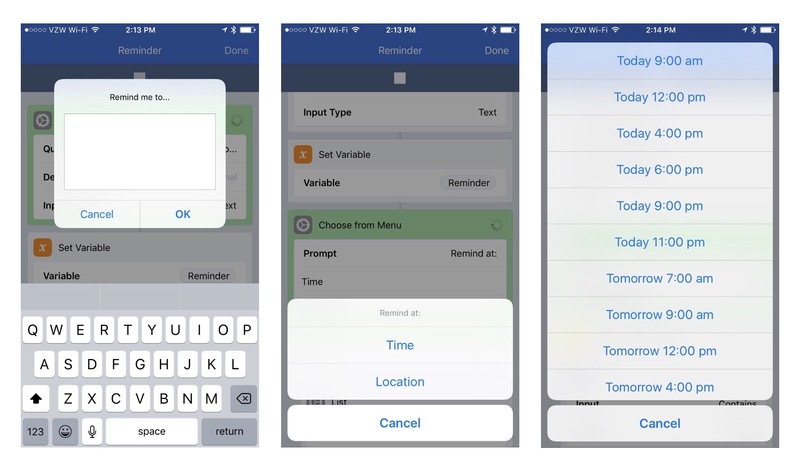 In minutes, I had built an “add reminder” action that I can trigger anywhere from the widget that asks for input and either presents a list of my most common times for an alert or one of three most-used locations (home, office, pharmacy). I can add a new reminder, with the right alert, in about half the time. It’s freaking great. More disappointingly, even though I adore Drafts more than life itself, it really isn’t the place for me to house my tasks and take action on them. The idea of a single Markdown list of the things I want to do was intoxicating, but it didn’t fit with my mental model of how I manage things I actually need to do. Once again, I was trying to make a tool do something it shouldn’t. So I changed the way I thought about these lists. I need to keep these lists handy, and they don’t always require action but I need to remember to check them (in GTD, this is a “review”) occasionally. I’m in Drafts all day long, for a million reasons. I’d never tried filters before, so I decided to give this a whirl. Not one list, but a few key ones. See, if these things are always accessible, in a tool I’m already using all day, I think I’m more likely to idly scroll through and do several quick reviews, and potentially cross some things off. This is definitely the big variable in this new system, and I’m waiting to see how it feels. So far, so good. Drafts doesn’t have line spacing controls, and one of the other things I wanted was a little more padding in the list views for ease of reading while I scan quickly. So I added a very basic Unicode character that creates a little bit of space between lines, allowing for a nicer view. I added that to an action key, and made an action list to send the draft to the right list.1 This is also good because I can filter against that same Unicode character, and keep things where they belong, keeping my inbox cleaner and actionable. Within the lists themselves, I can use the native link mode and line re-ordering functionality Drafts has to move items around (or delete them when complete) or view a URL I add to a task. Works pretty well. But what happens if I have an item in this list that I decide I need a nudge for? I took that same Workflow action I’d built, and modified it slightly to take a selected line of text from Drafts and send it through the same flow. It kicks it over and runs the same super fast steps and dumps it into Reminders for me, to ping me at some future point. So I’ve covered basic lists and the escalation point where I need an alert to move something along. I also mentioned Slackbot. My love for Slack is well-documented at this point. I’m always looking for different ways to use it. I decided to try using Slackbot for a certain class of nudge that is absolutely not mission-critical—one that I didn’t feel like seeing in a list every time I opened Reminders—as a test. So I have a handful of recurring reminders I’ve asked Slackbot to yell back to me every now and then. I have a “home” list of stuff we need to do around our house. Totally not urgent, has no time sensitivity. Every Saturday at 9am, Slackbot goes “hey check your home list and see if you can do anything today”. I don’t need to mark anything as done, and if I want to hear about it again, I can defer the reminder for later or the next day. This is only for stuff I kinda don’t really care about, but still want a poke for occasionally. So far, so good. And you can review what you’ve told Slackbot to track with a simple /remind list slash command. I’m still exploring this one, but it’s been fun so far. I’m currently trying to think of other little nudges that I don’t necessarily need to take action on, but that I’d like to see now and again. That’s pretty much it for now. For… now. Every time I change this system up, I feel like I’m losing my mind a little more, but I also feel like in restructuring everything, I keep learning about what’s important to me at different times in my life. And I’ve decided that this is my hobby. I really do like playing with these things. I have almost no free time, and a busy work and family life, and this stupid crap actually makes me happy. It’s not getting in the way of doing stuff, and that’s the important thing. So yeah, that’s this month’s experiment. I’ll let you know how it goes. Things I like this week, volume 29. This is a new podcast that I discovered thanks to it being featured on a recent 99% Invisible episode. It’s all about telling “the stories behind the world’s most recognizable and interesting sounds” and is exactly the kind of stuff I adore–people examining something that permeates our consciousness and culture at a deep level. Great storytelling, great production value. And the latest episode is literally about one of my favorite things: 8-bit sounds. I had the biggest grin on my face as I listened to it. A delightful show, and I can’t wait to hear more.